André VERLON (1917-1993). Die Ausschreibung muss lauten:"Liegender vor Landschaft" - Holzschnitt,13 x 18cm,signiert. I specialise in works on paper and small oils - mainly but not exclusively 18th and 19the century. Works on paper and paintings 1600 - 1950. Modern Prints. Antique Prints. Original by Vania Dodeva. Signed and dated on the front and on the back by the artist. 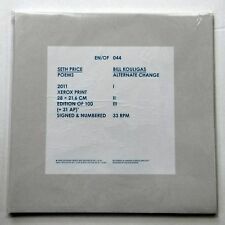 Schallplatte Kunstwerk von Seth Price, Musik von Bill Kouligas (PAN). En/Of Edition 2011, Deutschland. Dieses hier C17 Rot (= Edition von 34).
" Gridlock ". John Suchy. It also has the feel of explosive POP ART from the 60s 70s. It was handcrafted with a very thick cardboard book base slathered with hodge podge and hand-made 3D clay materials throughout, painted to a high standard with acrylics and Citadel washes. The book itself closes with a built-in magnet, but the locking flap is Velcro to close, attached securely with genuine leather and more clay accents. Aelhra - 2011 - Hot Collage Trio - Black & White Art Print Set. Artist: Aelhra. Class: Art Print. Technique: Screen Print. 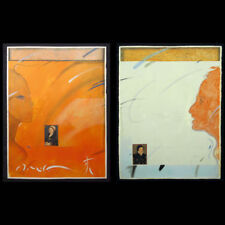 matched set of 3 serigraphs. This is an interesting piece that seems to have both tribal and industrial leanings. The three wafers in this artwork are a polished blank wafer, a rare multi-layer but incomplete wafer, and fully complete wafer. These three wafers were made by GMT Microelectronics just before the turn of century in 1999. Old hippy art gas tank. 1971 Triumph Bonneville tank. The old laquer paint is chipped and flaky in spots. Heavy metal flake sunshine scheme w a small airplane. One side has a hole, not sure if it penetrates the tank or just a flaw in the body filler underneath. Chipping near tank badge on the side with the hole is more recent . It would look great sitting on a shelf with the better side showing. Inside the tunnel looks ok, but there is rust flakes in the bottom. Very nice art by photographer Laurie coppedge. 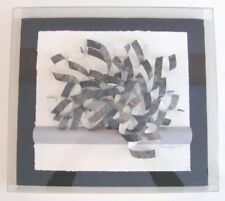 Jeanne Petrosky Original Paper Art Signed Matted & Framed "Beneath the Process"
Available as shown jeanne petrosky original mixed media paper art. Signed, matted and framed. 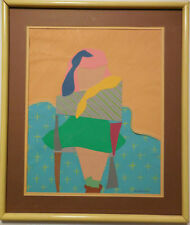 Framed size is approximately 16 x11 x 1.5 in. Frame does exhibit some light scuffing in a few areas and top right corner is a bit loose slightly separated. Quick remedies. Payment appreciated within 3 days from auctions end. Shipping and handling will be 34.99. Boxed with plenty of secure padding. Fantastic, 1-of-a-kind pop art piece. Striking display piece, great for any fan. John Suchy. " And Our Flag was Still There ". TM are dedicated to preserving and sharing these computing and communication technologies that changed the world. 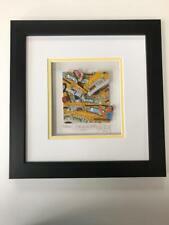 TM artworks are fine collectible artworks. On the back are the artist’s signature and a narrative describing the artwork and the 3101, 1101, and 1103. Mostek 5002 4-Digit Counter/Display Decoder. Motorola 68000 16-bit Microprocessor. General purpose computers started in the 1950s using vacuum tubes for electronic switches. These replaced the special purpose relay-based calculators that preceded them. Charles Yodelis 1911-1992. Such a fascinating little painting. It’s a beautifully executed oil on canvas board. While we were able to find little information about the artist, he was clearly well schooled. Texas Artist Regionalist ED CURRY Signed Print Multi Media "Cypress"
A fabulous Regionalist print "Cypress" by Listed Texas artist Ed Curry. It is titled "Cypress" lower left hand corner and signed Ed Curry lower right. There are a couple of spots that could be from condensation. 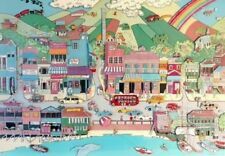 A very beautiful and high quality embroidery of a Lowry-style scene. Believed to be from 1970s/1980s. This really does look like a removed piece of Banksy Art, You can convince your friends into thinking you have spent thousands. Saving Banksy Artwork Produced by Splashlight-Art Studio. Happy Choppers Artwork 50 cm x 50cm x 1cm. Giuseppe SOLDATI. Italia,December 1943. Dating on the back by hand of the author:December 1943. Oil on board. The signature, at the bottom right and on the back of the dedication, is by. Marco 3382631734. By master Gaetano Pa. OLD OIL PAINTING. Cash withdrawal in person. Th 1827, from hisSir David Wilkie's Sketches, Spanish & oriental, drawn on stone by Joseph Nash. Printed by Charles Joseph Hullmandel and published in London by Henry Graves, in 1846. Sir David Wilkie (1785 –1841) was a Scottish painter, especially known for his genre scenes. Super rare Invader T-Shirt Explosion- White - Size Large- New in Sealed Invader Space-Bag W/ Label. Very Limited Edition. From Hong Kong Show 2015 Genuine Authentic. This exhibition literally changed her life. She moved to Chicago. John Suchy. " Bow Bridge Central Park". Published : 2010 - Edition # 287/450. TM are dedicated to preserving and sharing these computing and communication technologies that changed the world. TM artworks are fine collectible artworks. In the bottom right corner is an actual "PONG" chip. ORIGINAL 18"X24" POP ART PAPER COLLAGE "VAMPIRES" BY COLLAGIST DENNIS BILLOWS ("FAMOUS MONSTERS OF FILMLAND," "ODYSSEY SCIENCE FICTION MAGAZINE," CCI ART SHOW, "WHEN WORLDS COLLAGE" WEB SITE ARTIST). DONE IN THE ARTIST'S TYPICAL "LES AUTOMATISTES" STYLE. 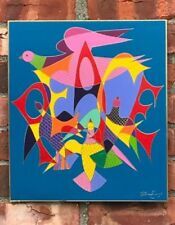 VERY BEAUTIFUL MODERNIST ORIGINAL ART. DONE BY MONTREAL, CANADA ARTIST SHIREEN KAMRAN. VISIBLE ART WIDTH 14 36. VISIBLE ART HEIGHT 10 25. I have been. ORIGINAL 18"X24" POP ART PAPER COLLAGE "WORLD WAR II SUPERHERO COMICS" BY COLLAGIST DENNIS BILLOWS ("FAMOUS MONSTERS OF FILMLAND," "ODYSSEY SCIENCE FICTION MAGAZINE," CCI ART SHOW, "WHEN WORLDS COLLAGE" WEB SITE ARTIST). SHELBEE MARES. picture is signed by the artist Shelbee Mares. Flores De Santos I. This is a box of antique burnishing supplies, including gold and silver leaf and powder. The box includes a gold leaf brush, a box of gold leaf, a book of silver leaf, and multiple envelopes of gold and silver powder, as well as an envelope of aluminum powder. Dimensions: The sheets of gold are just under 4" square. Condition: In as found, used condition with partial packets of gold and silver leaf and powder. There are also marked, sealed envelopes of which we cannot guarantee the contents. If you have any specific questions, don't hesitate to contact us. FROM A CATALOGUE. soon we wil list works from these masters. One handmade steampunk/altered art/assemblage sewing machine locomotive. Unique, one of a kind. Is dusty, dirty from being in storage. This one is heavy! All diamond color and clarity grades are. We fully insure all parcels and want to ensure that if there are any issues that they are dealt with in the most professional and practical manner possible. Japanese architecture drawing with mixed media signed M. Ishihama 1959 2. 12.